TD Ameritrade Advisors now have a new E&O Insurance option through the NAPA Premier E&O program. 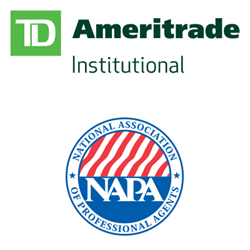 TD Ameritrade announced today that the National Association of Professional Agents (NAPA) has been added to their list of approved Errors & Omissions (E&O) Insurance providers. The NAPA Premier E&O program starts at just $73.75 per month after down payment and provides broad coverage options designed to meet the professional liability needs of Registered Investment Advisors (RIAs) and RIA firms. The policy is a duty to defend contract underwritten by Nationwide Mutual Insurance Company, rated A+ XV by A.M. Best. As the RIA industry continues to evolve and grow, it’s important for RIAs to proactively manage their firm’s liability risk exposures. Errors & Omissions Insurance is an integral component of this practice management process especially for those newly formed RIA firms. Since 1989, NAPA has been a trusted provider of professional liability insurance for financial professionals. Currently serving over 100,000 clients, NAPA has a unique understanding of the new and complex liability exposures facing financial professionals. To learn more about the NAPA Premier TD Ameritrade E&O program, visit http://www.napa-benefits.org/TDAmeritrade/errors-and-omissions or call (866) 389-0023. Brokerage services provided by TD Ameritrade, Inc., member FINRA / SIPC.